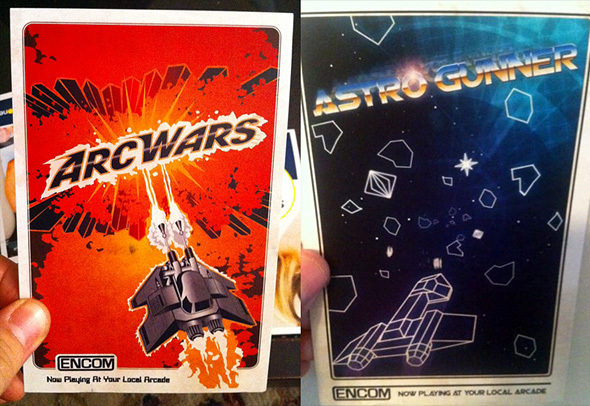 When I picked up my mail today I found a rather peculiar postcard for a video game called ArcWars. 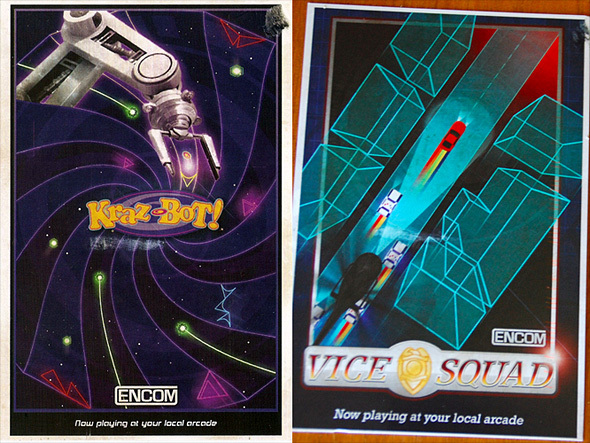 Upon closer inspection, I notice that there was an Encom logo at the bottom and the phrase "Now Playing at Your Local Arcade." It looks like the Tron Legacy viral is back in action! 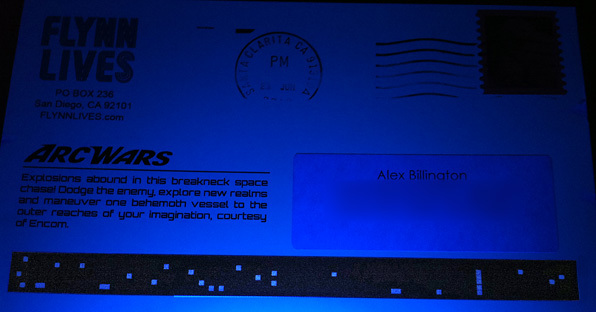 The back of the postcard is postmarked from Flynn Lives in San Diego and contains a little description of the ArcWars game and an ominous black bar. It turns out that black bar contains another viral clue that only shows up under blacklight (more below). I've heard that numerous fans have been receiving these postcards today and there's a total of four of them. According to Unfiction, there are a total of four postcards floating around. Each one is for a different video game created by Encom back in the day: ArcWars, Kraz-Bot!, Vice Squad and Astro Gunner. So what is the black bar all about? Well, if you take a look at the photo below, a series of small squares show up in a coordinated arrangement, but that's all there is. Some of the Unfiction guys think it's part of a grid that will spell out or provide a code once all four of the postcards are put together, but they haven't had any luck yet. I've included a few photos of the different postcards that have been sent out for reference below. Whenever virals kick back up like this, there's always a bit of speculation and mystery surrounding the clues before we discover the next big step. Maybe there are some missing pieces to this blacklight grid we haven't found yet? We know that Tron Legacy is going to have quite a big presence at Comic-Con this year so I'm guessing it might be the start of an intro to that viral, but I'm sure we'll find out more soon enough. For now I'm excited to have received one of these postcards and I hope a few of you guys also received one, too. We'll keep you updated on all the latest with the Tron Legacy viral, but for a full recap, visit our Tron viral category here. These look great, get em on Ebay! My Husband and I both registered and we both received a different card yesterday. I was pretty excited about that! (Astro Gunner & Vice Squad) now I just need to find a damn black light! I got mine today (Kraz-Bot!) Checked it under a blacklight and along with the black bar on the back it has an orange barcode on the front left side. The retro artwork is very nicely done. hey I got one today and im over the atlantic in scotland! I got the kraz-bot one, at firdt I hadn't a clue what it was first until i read 1983 and of Flynnlives put to together TRON! I'm in London, Uk. I got mine! Astro Gunner. I wonder...If you took an image of the hidden 'dots', and overlaid them on top of each other (A La Photoshop) Perhaps they would spell out...... I don't know, Something? Checking in from Germany. Got my postcard today: Vice Squad. The overlay method has already been tested. So far nothing really conclusive, but it seems to be forming a phrase. Maybe we have to check for other clues regarding the games as the code on each kind of postcard seems to remain identical. Has anyone noticed the front of the Vice Squad postcard has a series of orange lines on the front that show up under black light. Dude i have the orange lines on the front of my vice squad card too. Anyone else have them on their cards? Does anyone know if all 4 of the cards have different codes in the black stripe? I've not seen any others to compare. I only have the Arc Wars card. Can't wait for the SDCC. Ticket bought. Gas tank full. Room ready.